Rescued birds find a home on North Caicos. 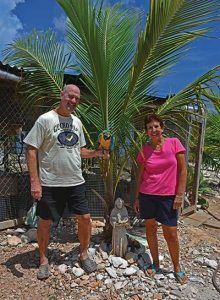 Calling someone a birdbrain usually isn’t very nice, but if you take the words literally—as in, someone who thinks about birds a lot—you have a pretty good description of Patti DesLauriers and Howie Bartels of North Caicos. Howie, Scooter and Patti stand by a statue of the patron saint of animals. When they moved to the Turks & Caicos Islands from Texas in 2013, the couple arrived with nine birds among their pets. Then they started helping others who’d discovered that big, beautiful birds can be a big, beautiful hassle. Today, their Major Hill home is an accidental aviary and bird sanctuary, with three macaws, two cockatiels, a Quaker parrot, one sun conure, a parakeet and some chickens, one of which seems to think it’s a parrot, as it roosts like them. All of the larger birds are rescues, and the couple are encouraging natural flight among the macaws. The process of bringing birds into the TCI is complicated, requiring much paperwork and tricky timing. There are import permits, health certificates and inspections on both ends of the trip, plus specific rules for shipping live animals. It took both of them to do it, Patti says, with her handling the U.S. process and Howie available to receive the birds when they arrived. Sometimes, it seemed next to impossible, she relates. “You need a USDA (Department of Agriculture) accredited vet to take blood for testing. Then there’s only one lab in Iowa that does the test,” she says by example. Because other tests must be done close to the TCI travel date, she also had to find an avian vet in Miami once when she drove the birds there from Texas. “I did have a meltdown. I cried,” she admits. Ultimately, though, they were successful. Macaws were not among their original birds, but not long after Patti and Howard got their “flock” settled, they began hearing from people who needed help in caring for macaws that had been brought to the Islands long before. Howie added on to their first backyard aviary, and they began adopting the big birds. “Macaws are very noisy, and they demand a lot of attention,” says Howie. Patti adds, “Having a macaw is like having a spoiled two-year-old your entire life.” The birds are long-lived, and can be quite unhappy in cages, which is why many owners have the flight wings clipped. But the birds are happiest when they can fly and be themselves instead of exotic live ornaments. The three macaw rescues at Howie and Patti’s home are Papi, Oro and Scooter. They are, respectively, a Green Wing Macaw, Blue-and-Gold Macaw and Catalina Macaw. Their stories highlight the many needs of the birds and the work Patti and Howie are doing to meet those needs. Papi, originally named Lollipop, was brought from New Jersey to TCI when Provo was beginning to develop. His former owner let the bird fly freely until he was asked to cage it because it was frightening people, so Papi was confined with another bird. “They were angry and hated each other,” Patti relates. “Papi started plucking himself.” When he came to the couple two years ago, his chest was nearly featherless. The Provo owner gave him up with the condition that the bird eventually be allowed to fly again. Today, Papi has stopped plucking and does indeed fly freely in the Major Hill area, returning home for food or when he is called. He favors guineps from one neighbor’s tree, has “conversations” with another neighbor, and is generally known in the area because he likes people. Patti says that according to the sightings she hears about, he doesn’t stray far from Major Hill. He is now 67 years old and will likely stay a free bird the rest of his life. And then there is Scooter. “Scooter is an angry bird,” says Howie. He was originally owned by Robert Luker (“Scooter Bob”) of Provo and was one of a pair. After the other bird died, Howie continues, “Scooter became lonely and depressed, then mean.” He was sent to North for a better life, and Howie and Patti took on his care in 2014. While the bird has bonded with Howie, it does not like Patti, telling her to go away (in much saltier language) every time she comes near. Even as he jealously favors Howie, he’s also particular about him, not allowing Howie to wear glasses when he enters the aviary. He was not too happy about a camera, either. Scooter is, however, responding to the couple’s care, most notably in a bit less profanity and a willingness to try out his flight abilities. Patti and Howie, believing that birds should be free, have let the clipped wings of Oro and Scooter grow out, and Howie’s aviary includes an area big enough that they can practice flying. Both have flown outside the aviary in escapes, but, says Patti, “It scares them. Howie has had to rescue them,” one time from a neighbor’s roof. But the goal is for all the macaws to be as free-flying as Papi. Flight rehabilitation is only one part of the care that Patti and Howard provide for the macaws and their other birds: Buddy the parakeet; Gemma the Sun Conure; Bob the Quaker Parrot; and cockatiels Tilly and Tango (plus Chicklet, the parrot-perch chicken). The couple regularly orders seed in bulk from an outfit in Oregon, and their grocery list is larger than it might be because of sharing their fruits and vegetables with the birds. “They will eat most of what we eat,” says Patti, noting that they eat even meat and particularly like ramen noodles (without the seasoning) and beets. They are not supposed to have shellfish, though, and any treats of peanuts must be sparing, as they can have a moldy toxin. Caring for so many birds is difficult, but it is obvious that Patti and Howie love it and would like to expand their efforts. “My dream would be for this to be a sanctuary,” Patti says. “If anyone has birds they can’t take care of, we will take them.” Indeed, days after our interview Patti and Howie took on the care of a rescued gull sent over from the Turks & Caicos SPCA. The bird would not eat on its own, so they began the process of trying to restart its natural feeding. For rescues and/or visits, email Patti at pdtx58@yahoo.com or phone Howie at (649) 243-9649.